Our team work in a customized way to produce videos. We capture images in live broadcasts, instantaneous broadcasts to large screens, video creation in motion, 2D animation, institutional videos, sport events, religious services, workshops, internet ads and video marketing. We are encharged of every step on a institutional video creation, starting on the briefing and all the way to the final edition to deliver the perfect job that meet our customer expectations. We produce and edit your web content accordingly your purpose and audience. We provide professional advisory to post it on social networks. Distance learning video creation is growing in our country. Our company has the perfect tools to your college institution so they could create learning video material with high quality audio and video. Nowadays animated video creation with Motion Graphics is an excellent way to a company communicate with his audience, convey your message, improve your brand and show your products and services in an animated 2D or 3D video. We make event coverage with interviews in corporate events and communities. We have been creating the most important market-fair content for three years such as official video, interviews with stands agents, video material for panels and recording lectures and congresses. Request a quote for the intended streaming service. Motion design promo videos for top companies. 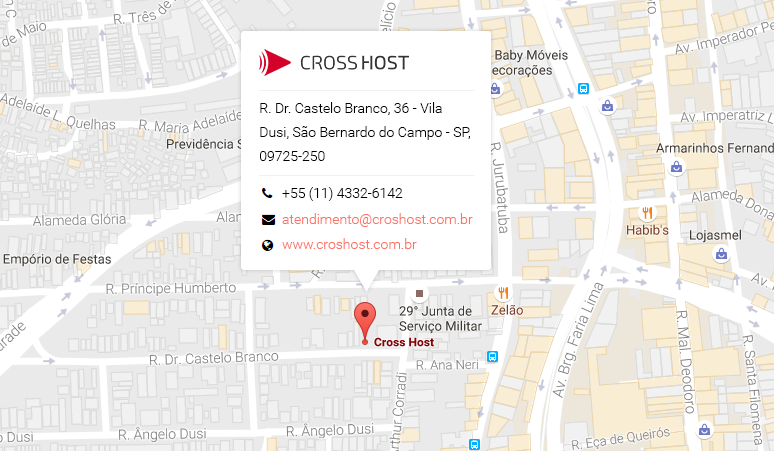 Cross Host currently have 1600+ customers all over Latin America. Cross Host is a streaming leader in Brazil, and have more than 1600 active customers in Latin America, including radio and tv stations. Please register your e-mail to receive our news and we'll always notify you. ©2019 Cross Host - All rights reserved.